THLord Marko Evanovich Panfilov is a scribe and cartographer in the Barony of Dragonsspine in the Kingdom of the Outlands. In addition to scribal arts, Marko is also interested in woodworking. Marko is of Russian decent, born in 1482 in Kiev. Second son to a wealthy merchant, Evan Pavelov, Marko moved to Venice, Italy when he was 5 years old as his father started negotiations for a direct sea-trading route between Venice and Kiev (via Constantinople). Marko's brother, Stefan, remained in Kiev to run the shipping business there. Ignored by his father, Marko was close to his mother, who helped Marko become educated in the finest universities of Venice and London. During his travels to London, Marko became interested in the sea, especially in the science and art of cartography. Recent voyages by Columbus spurred Marko's interest in cartography. 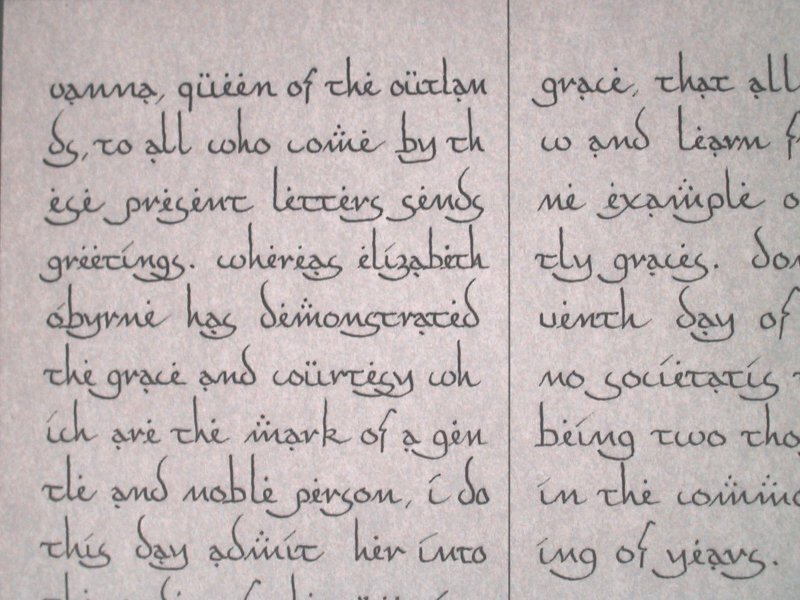 A very basic class on the introduction to SCA calligraphy. Describes how to design simple Celtic knotwork using two methods: the "Interlace without Erasing" method, and the "Centerline" method. 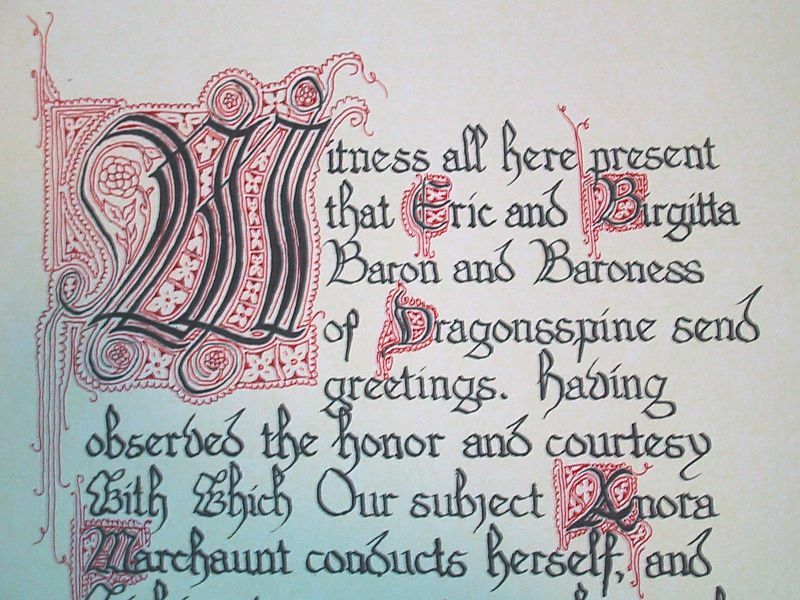 Taught at Dragonsspine Candlemas (Feb 1st, 2003) and Outlands Kingdom Heralds & Scribes Collegium (March 2003). 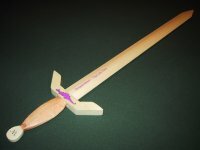 Looking for examples of SCA A&S Documentation? Here is a list of online A&S Documentation for entries that I have created. Each of these entries earned an average score of higher than 4.5 out of 5 in the documentation criterion. 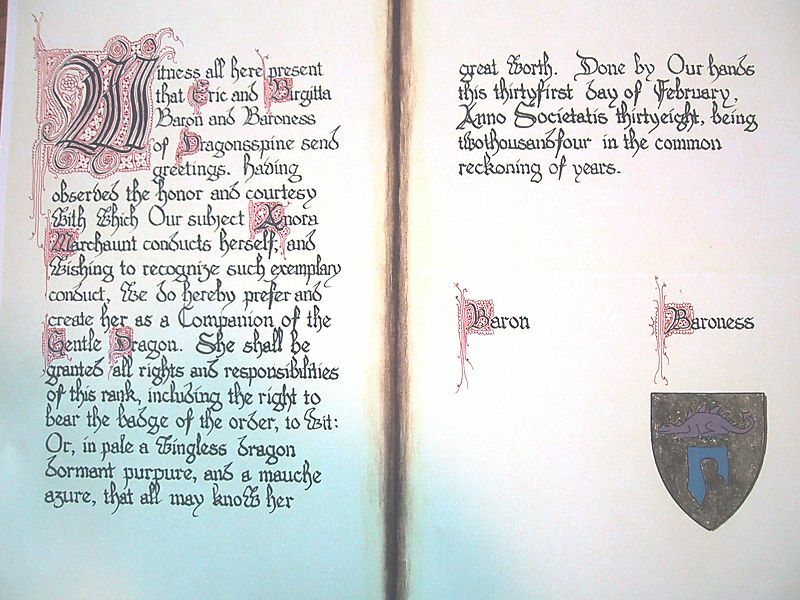 These entries follow the guidelines for A&S documentation used in the Kingdom of the Outlands and the Barony of Dragonsspine. Other Kingdom standards may vary. Sept 28th, A.S. 37 (2002) (Dragonsspine A&S). 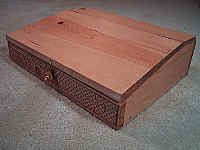 A Scribe's Writing Slope. This wooden box holds plastic tackle boxes containing pens, brushes, paints, etc. It is carved with a Celtic knotwork design on the front. This project placed First in the Functional category of the Outlands Kingdom A&S Competition (A.S. 37). See the A&S Documentation for more information on construction and historical background. 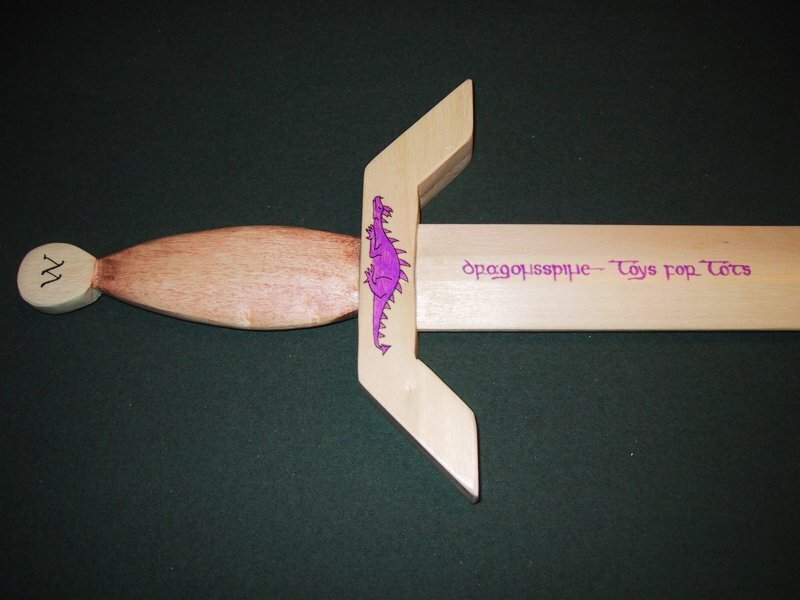 A wooden sword created for Dragonsspine Toys For Tots. This sword is awarded each year to that Gentle who best represents the spirit of Toys For Tots during the event. 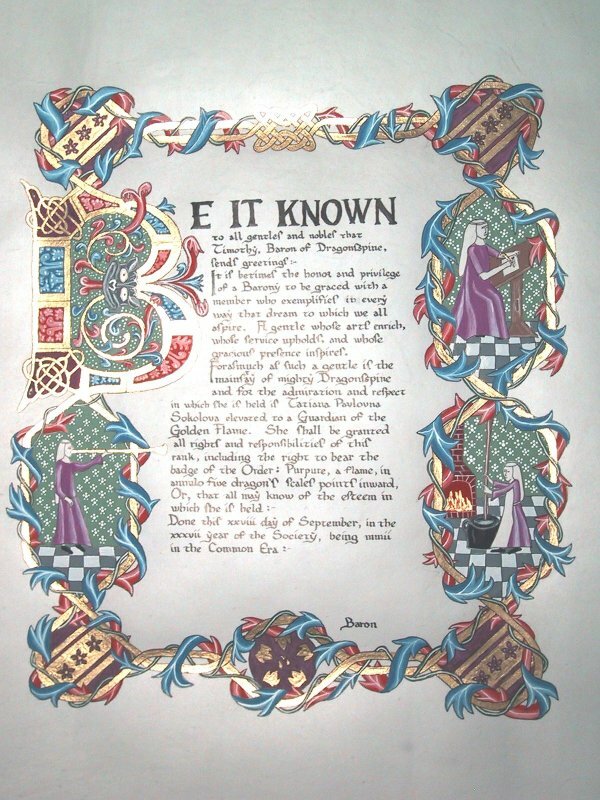 First awarded to THL James Qui Connait, November A.S. 37 (2002). See a closeup of the hilt. See the A&S Documentation for more information. Dragon's Grace for Turlough MacAngossa. Design: Based upon an Italian Renaissance work by Bartolommeo Sanvito. 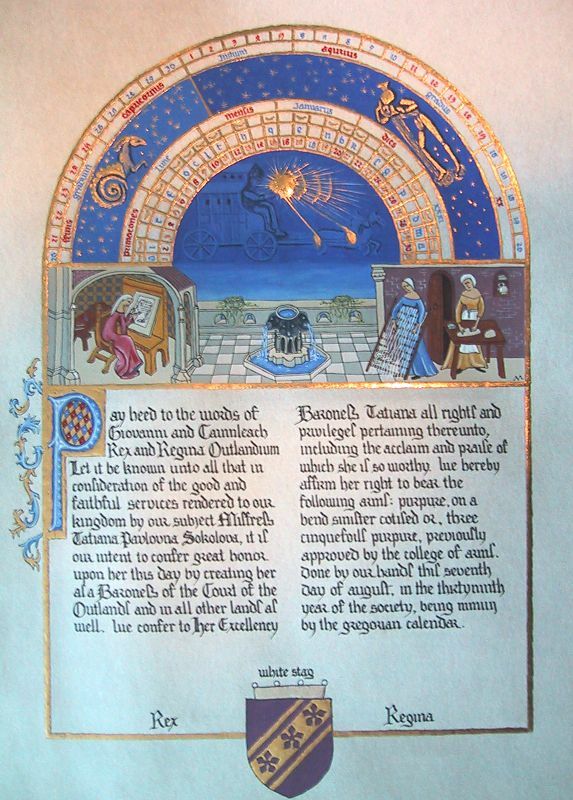 See "Calligraphy & Illumination" by Lovett, pg 90. Cherubs in illumination have been replaced with Dragonsspine dragons, facing towards the Dragon's Grace badge in the center. Hand: English Carolingian from Lovett, pg 67. Slight variation in the 'f' and 'g' letters. Also, the 'w' is more rounded. 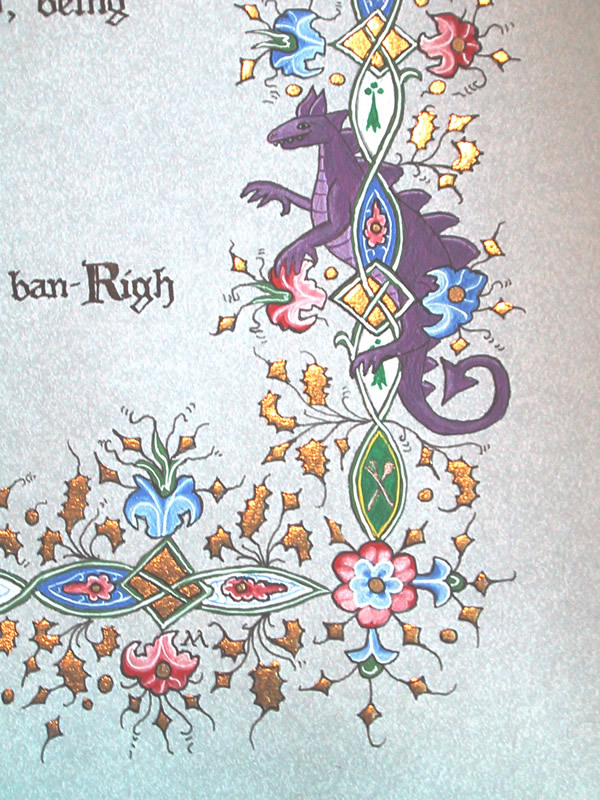 Colors: The entire scroll is tinted towards the Dragonsspine purple color (aquamarine+madder red, with a bit of white). The pink marble columns (white with a touch of madder red and a touch of dragon purple) are shaded with increasing amounts of dragons purple. Texture of columns achieved by adding a bit more water to the paint. The "sable" of the Dragon's Grace is done with Pearl Black (black with silver), highlighted with Iridescent to give it a shiny metal look. The argent dragon's scale is in silver. Design: Celtic. 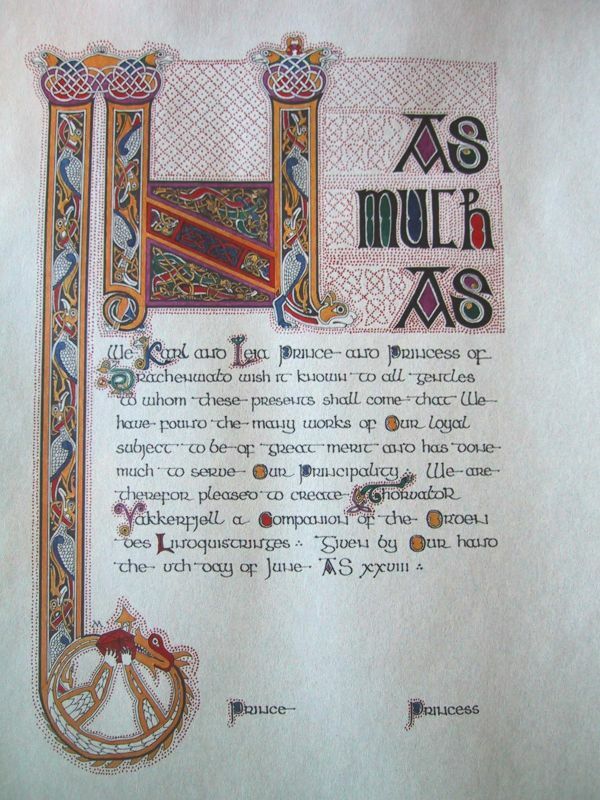 Inspired by Book of Kells. 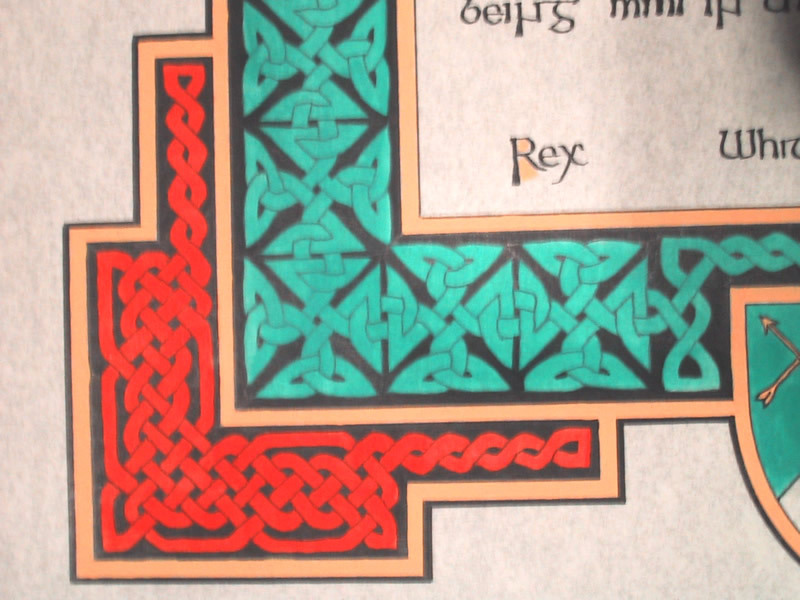 Knotwork border is original, although follows period Celtic designs. It wasn't copied from any specific work, however. 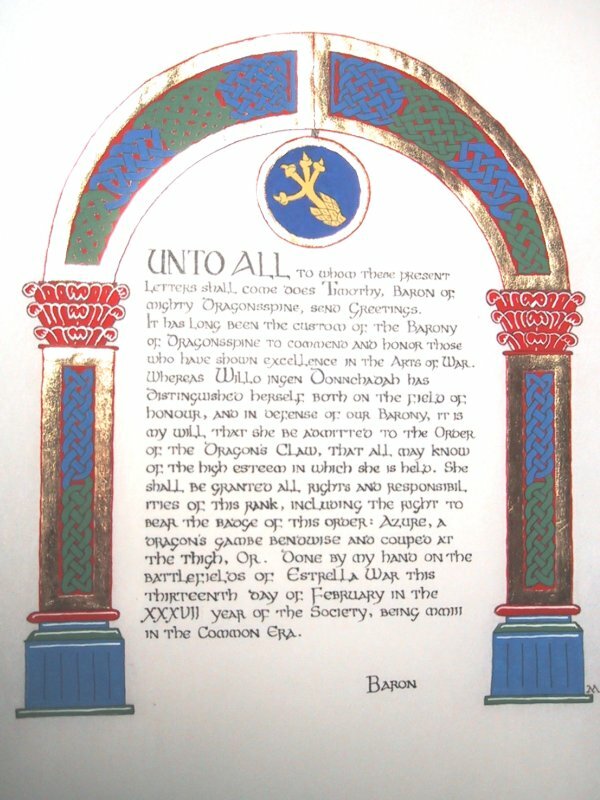 The illuminated capital U is similar in design to and example in "The Celtic Art Source Book", by Courtney Davis, pg 120. Hand: insular majuscule from Drogin, pg 111. Colors: All colors are similar to period. Red background in knotwork was very common, as was yellow thread. Gold was not used. Blue was chosen to reflect Dragonsspine blue and yellow. Viewed from a distance, the red and blue combine to form Dragonsspine purple. 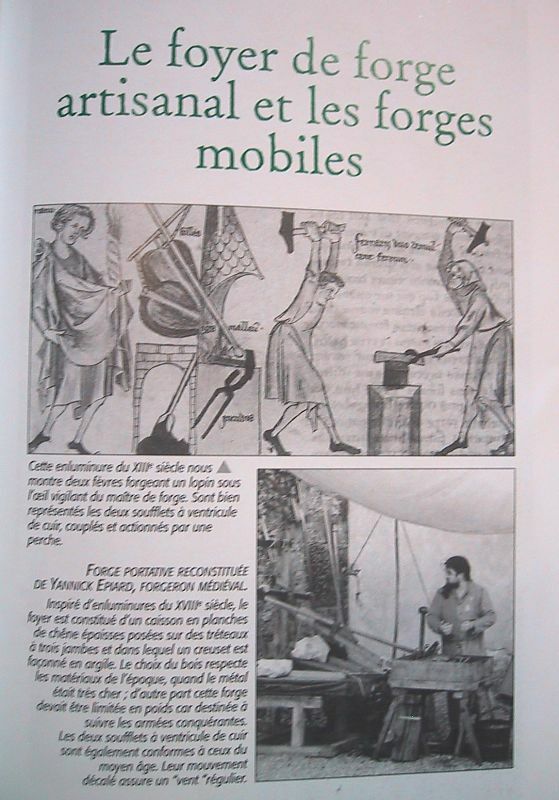 Design: Late 13th century French design. 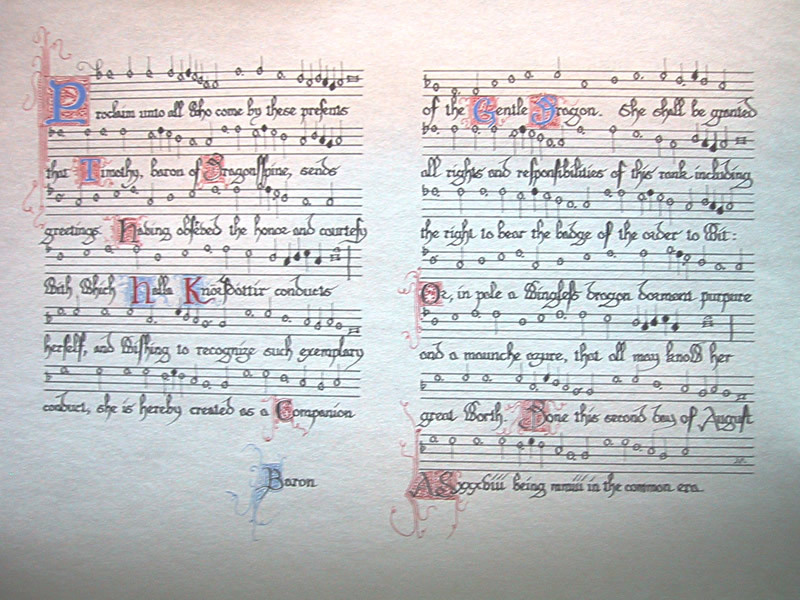 Style inspired by Psalter of Jean duc de Berry (see The Illuminated Alphabet, pg 92). 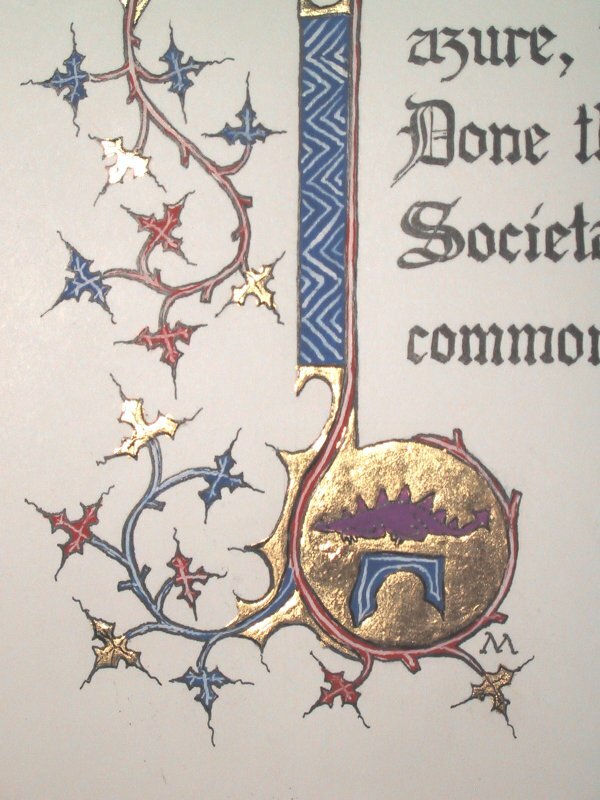 Vine border inspired by Visconti Hours (LF 95v. Israelites Leave Egypt) (http://www-physics.mps.ohio-state.edu/~prewett/medieval.html). 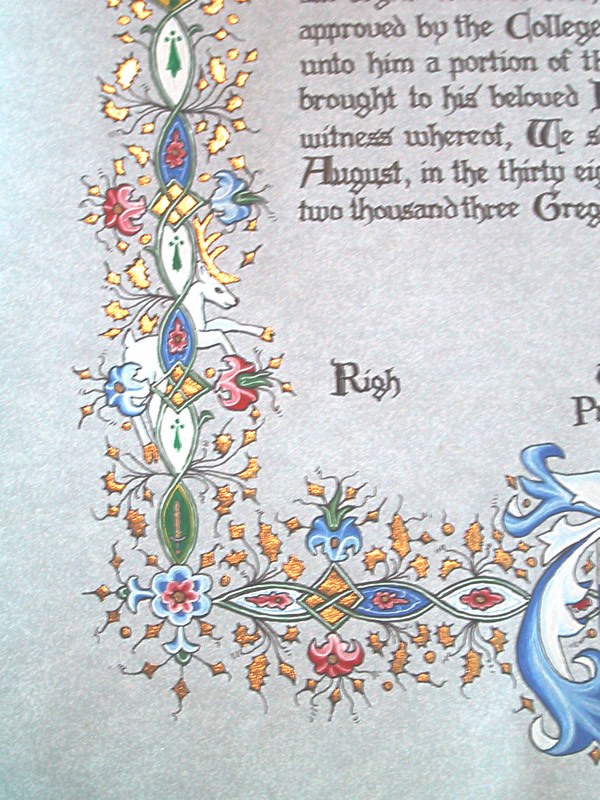 Illuminated capital F is original design based upon period patterns. "Doodles" filling the lines to the right margin are taken from other French manuscripts (Internet, lost link). Hand: Gothic, from Drogin pg 139. Capitals taken from "Medevil" computer font from an SCA web site and is similar to capitals shown in Drogin pg 142. 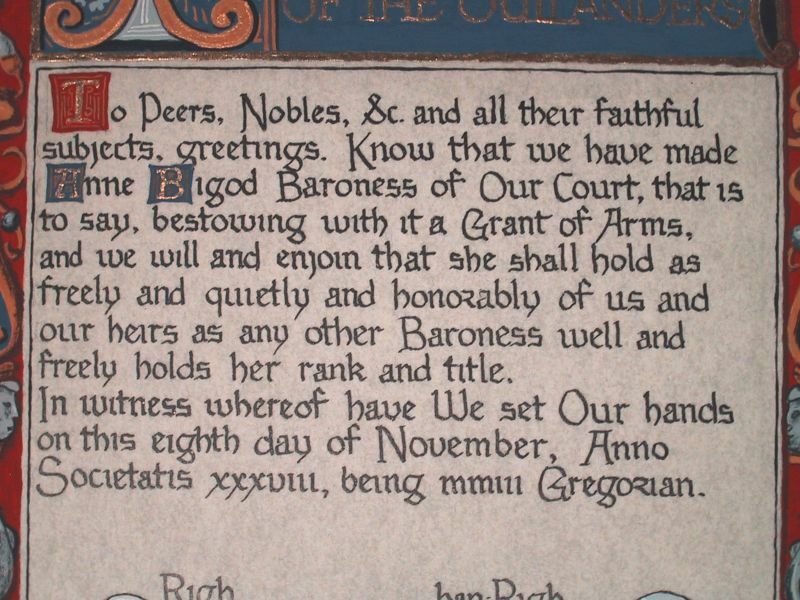 Capitals were done with a Pigma Micron rather than the dip pen used for the rest of the text. They are not quite as black as the rest of the text. Colors: All colors are period. 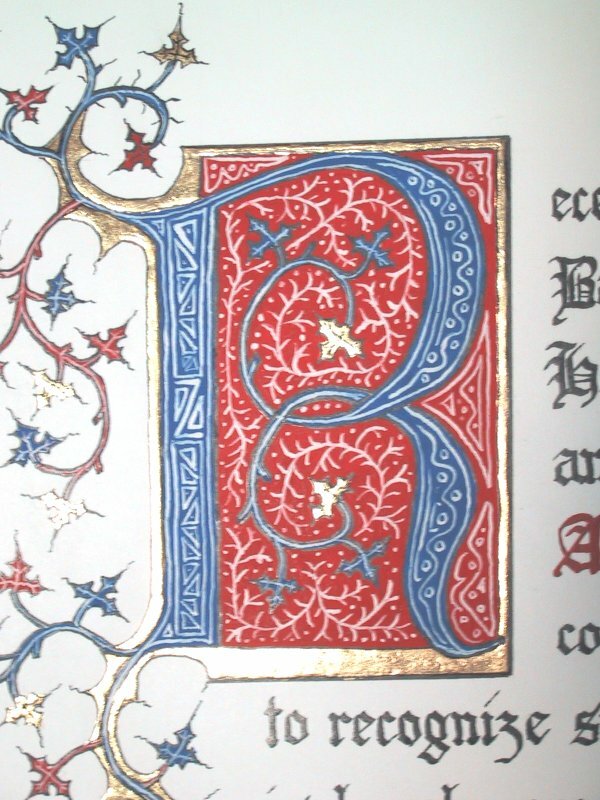 Extensive use of gold leaf, especially in initial capital was common. 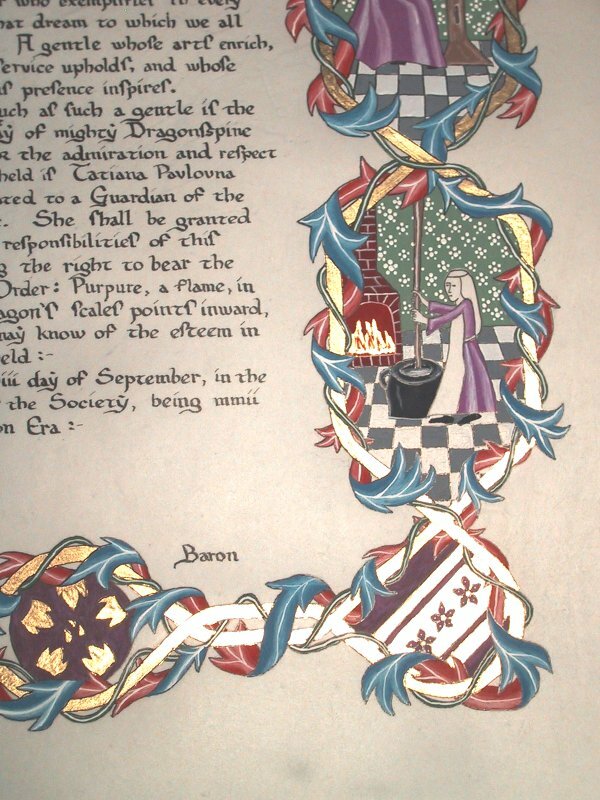 This scroll uses gold gauche instead of gold leaf. All white work is white gauche, applied with a fine brush. Design: 15th century Italian Renaissance design. Freehand, no traced elements. 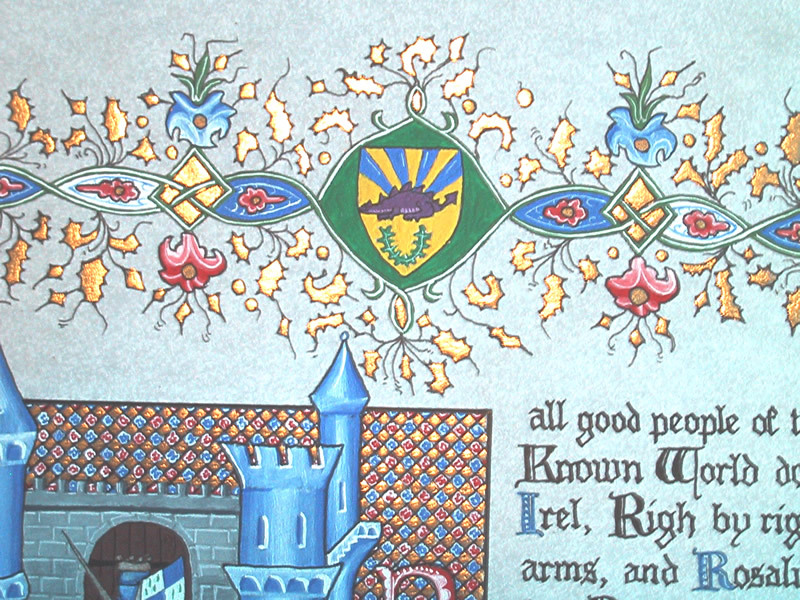 Overall design and Acanthus vines inspired by Psalter & Missal excerpts from "The Whetenal Psalter." MS. Don. d 85, fol 29r Psalm 38. (http://www.bodley.ox.ac.uk/dept/scwmss/wmss/medieval/mss/don/d/085.htm, http://www.bodley.ox.ac.uk/dept/scwmss/wmss/medieval/jpegs/don/d/1000/08500284.jpg). Detail of Dragon's head in capital D inspired by "Breviary of Martin of Aragon", 15th century (http://www.bnf.fr/enluminures/manuscrits/aman11.htm) from page "Prophet Isaiah" BNF, ROTH 2529 fol. 105v. Hand: Italian Rotunda, from "Calligraphy & Illumination" by Patricia Lovett, pg 83. Details: Gold leaf used for major elements (using acrylic size from Mistress Tatiana's gold leaf class). Windsor & Newton gold ink used for straight border elements and gold line work within the capital D (done with fine brush). Schmincke gouache used for blue, red, and white work. White shading done with dilluted gouache and blended with just water in brush. 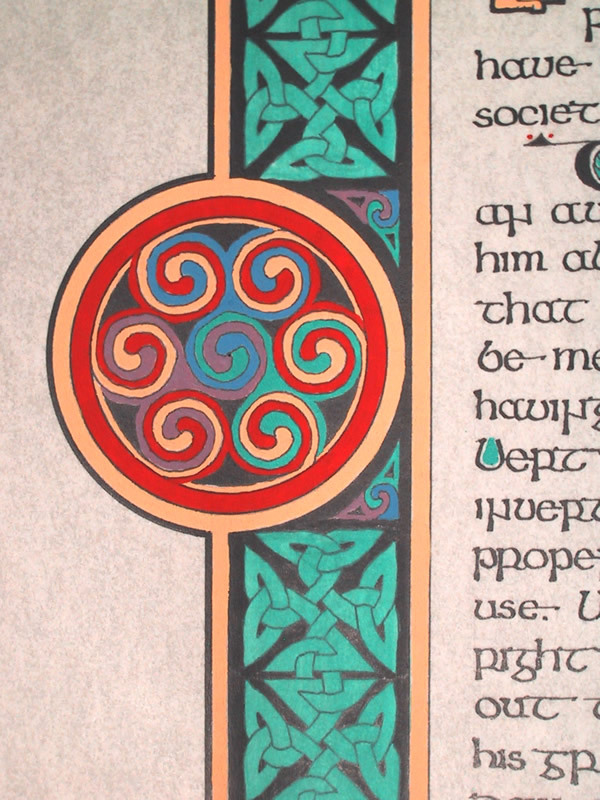 Design: 8th century Celtic. Freehand, no traced elements. 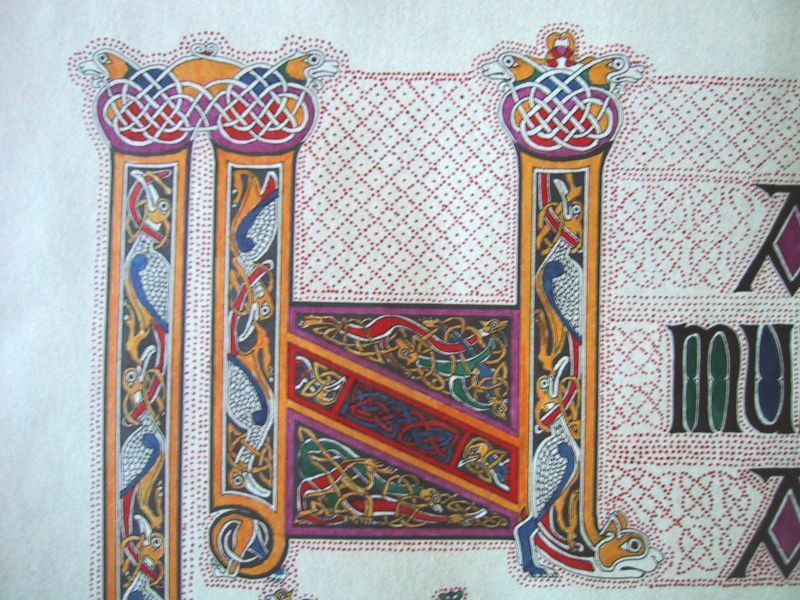 Dragon heads in "C" taken from the "Crucifixion Page" (page with capital "T") in Book of Kells. Hand: Insular miniscule from Drogin, pg 115. Design: 10th century Arabic/Byzantine, inspired by Byzantine tile mosaic. Original design. Lots of gold leaf. Schmincke gouache used for blue, red, green, and purple colors. Design: 14th century England, inspired by the Luttrell Psalter. Filigree patterns around versals. 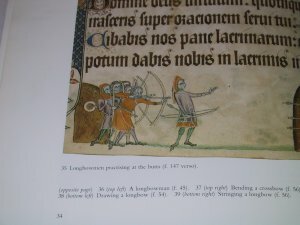 Archery miniature taken from Luttrell Psalter f. 147 verso, Oak tree taken from Luttrell Psalter f. 59 verso. 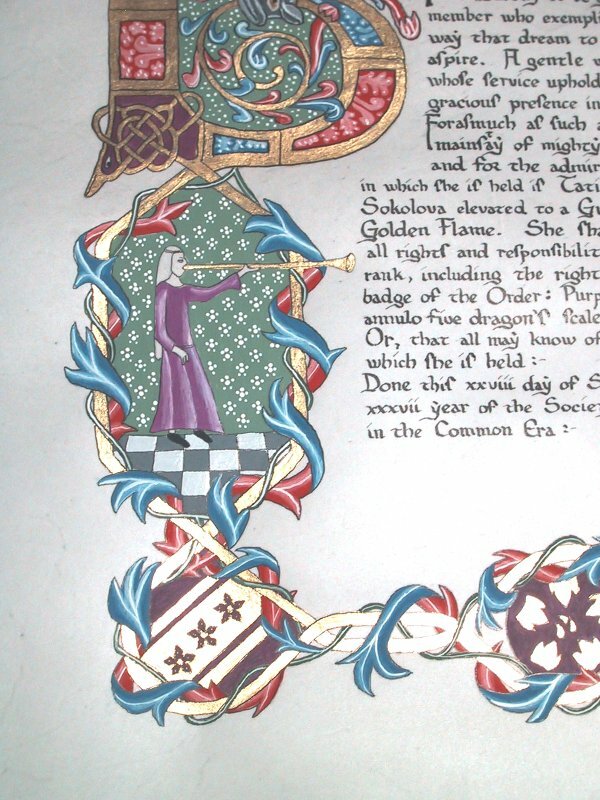 Also see a description off the Making of this scroll with many more pictures. 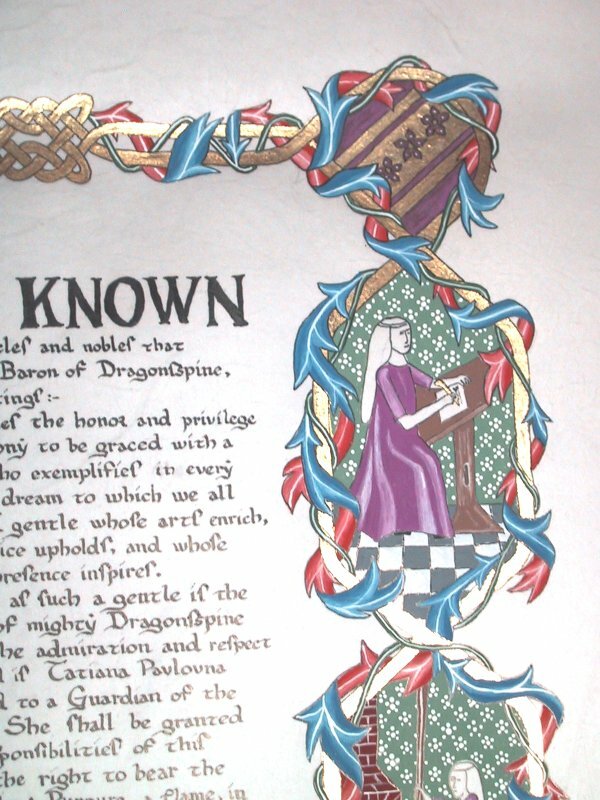 This scroll placed first in the Visual Arts category of the Dragonsspine A&S competition (A.S. 37). See the A&S Documentation for more historical information. Hand: Gothic, taken directly from Luttrell Psalter. 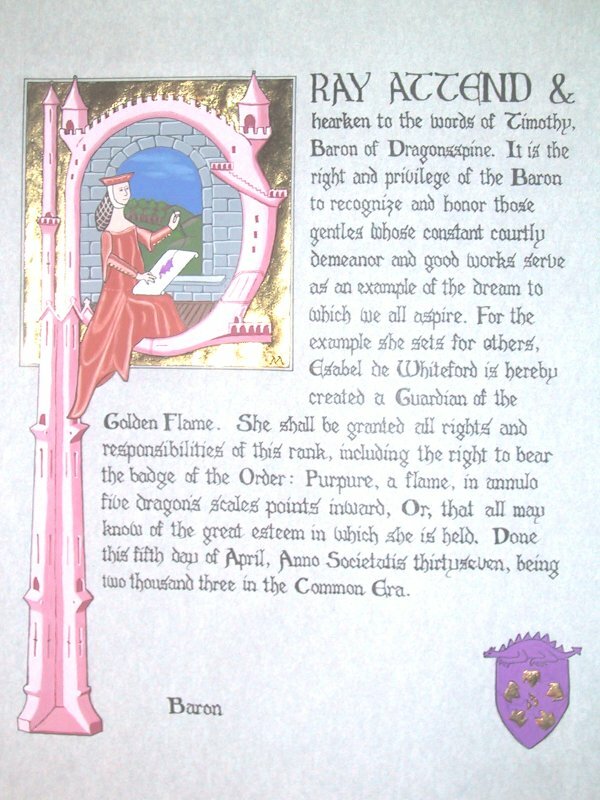 The Guardian of the Golden Flame is the Dragonsspine Baronial equivalent of the Outland's Walker of the Way award. 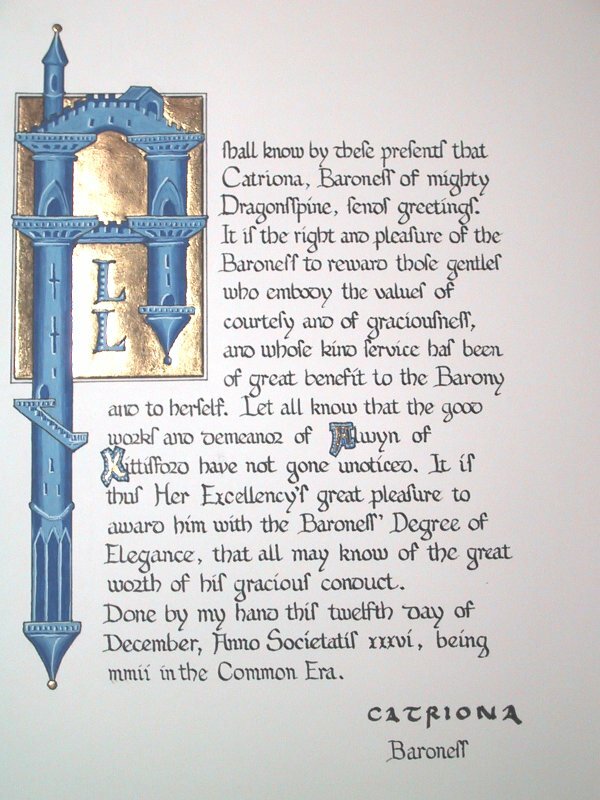 It is the highest achievement within the Barony. Coincidentally, on the day this award was presented, I was to become apprentice to Mistress Tatiana (although I didn't know this when the scroll assignment was accepted many months earlier). 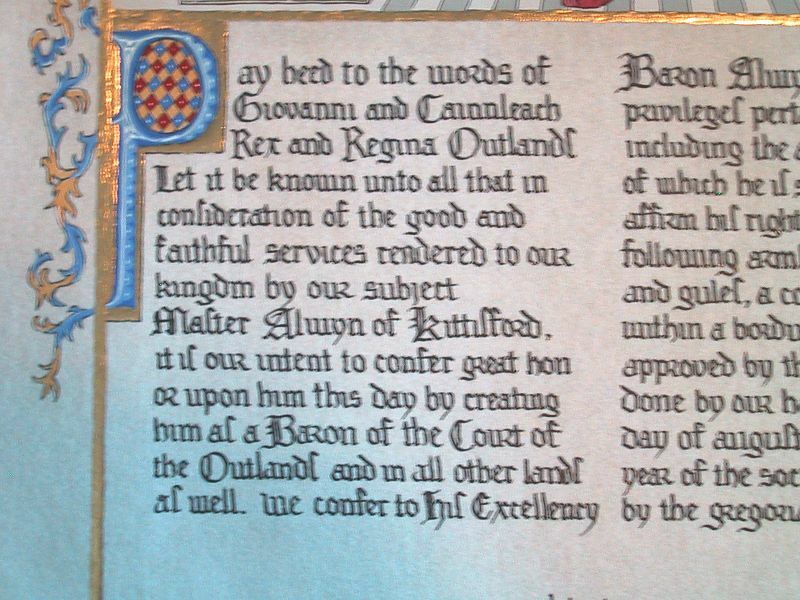 Because of the special nature of the award, and because of the special nature of the recipient, I treated this project more like a peerage award rather than a normal scroll. I expect it to remain as my best work for some time. Design: 10th-11th century England (Romanesque). 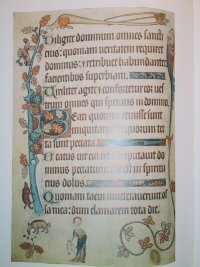 This scroll was done on period calfskin vellum. Calligraphy and all line work done with metal-nib dip pens. Illumination done with Schmincke gouache and brush. Gold leaf applied with period techniques using modern acrylic size to handle the low humidity of Colorado. 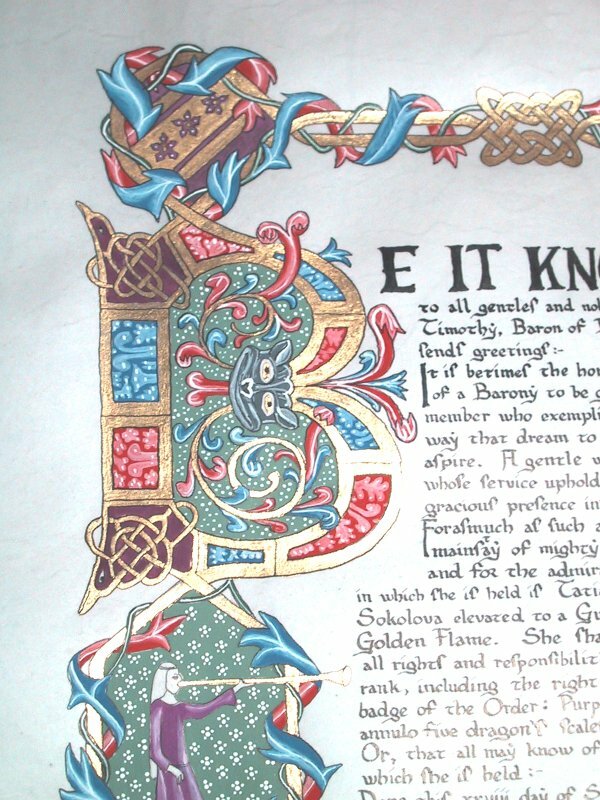 The initial 'B' is taken from the Ramsey Psalter (MS 2904 fol 4 B. Psalm 1), also known as the Harley Psalter. 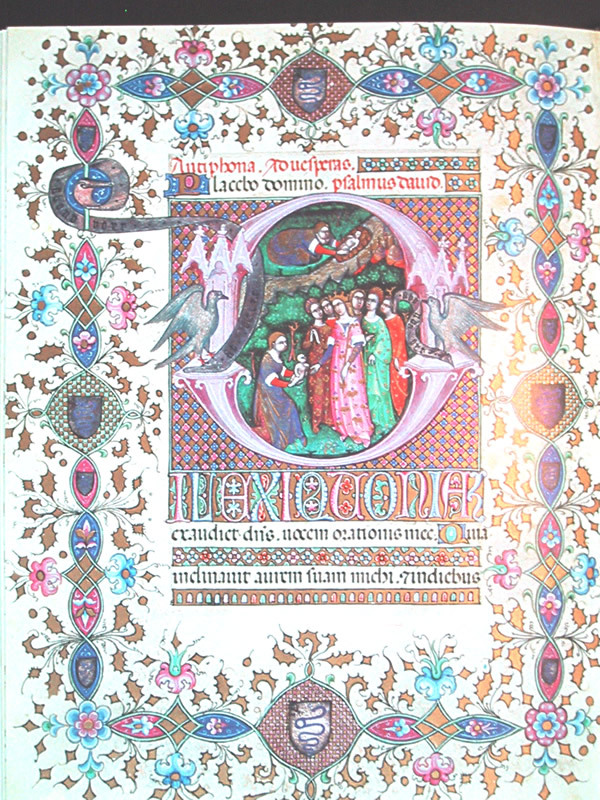 The other miniatures, showing Mistress Tatiana as a Herald, Cook, and Scribe are original works done in the Romanesque style. The four corners contain her arms, and the badge of the award is displayed in the lower center. No tracing was used, all elements are drawn freehand. 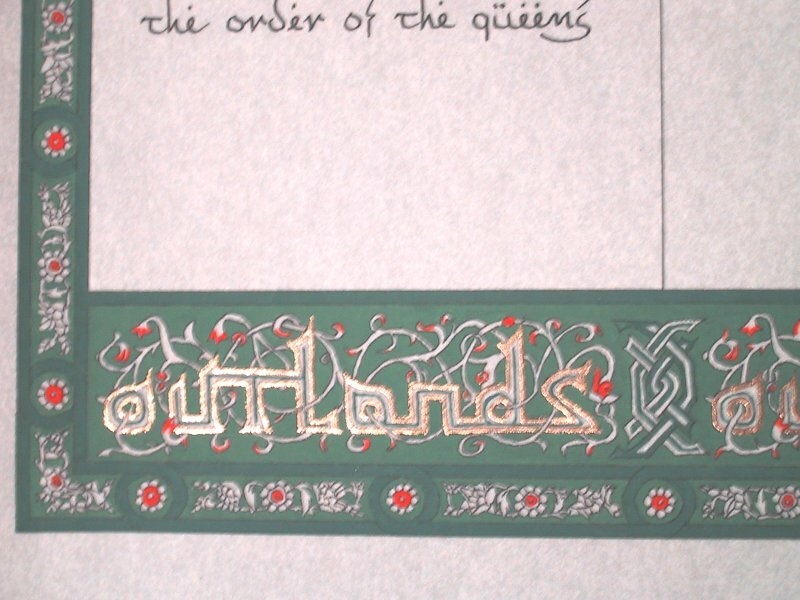 This scroll placed second in the Visual Arts category of the Outlands Kingdom A&S competition (A.S. 37). See the A&S Documentation for more historical information. 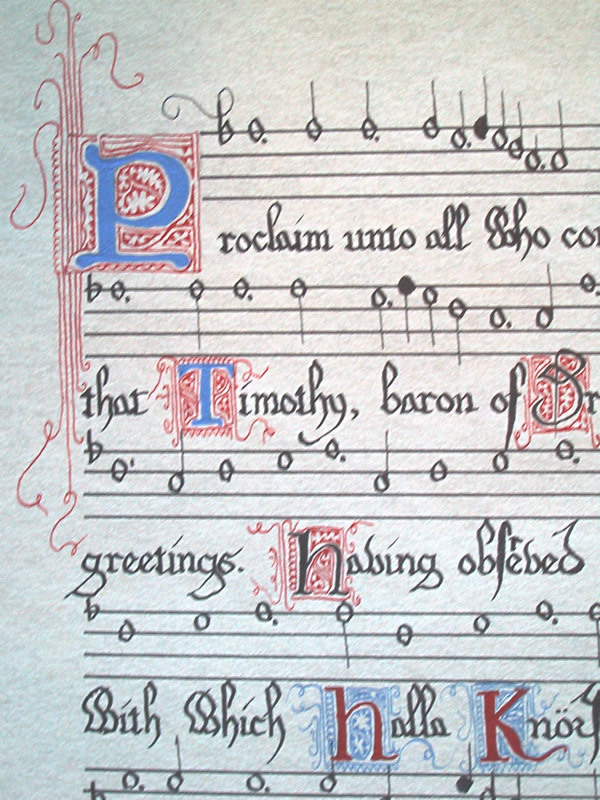 Hand: English Carolingian, taken directly from the Ramsey Psalter (fol. 36). Design: late 14th century Italian, based upon The Visconti Hours. 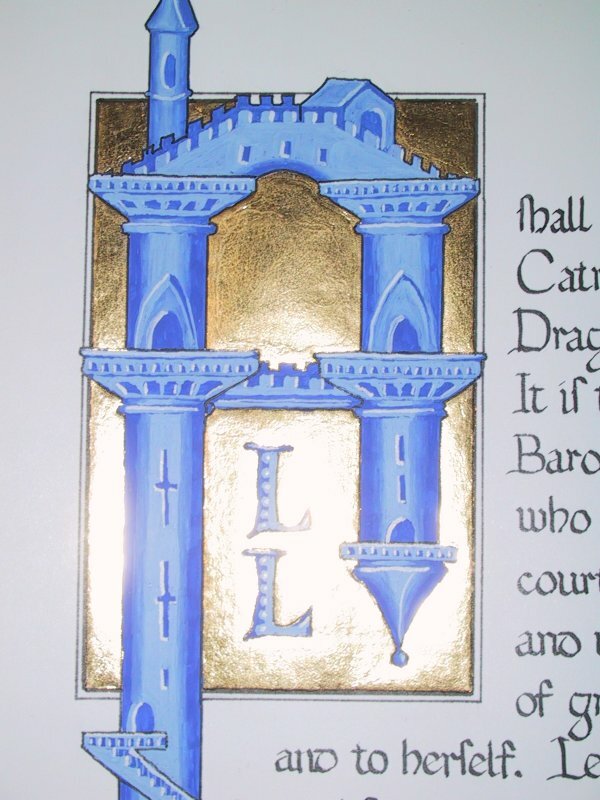 Inspired by blue castle illumination in LF85v, this illuminated 'A' castle is an original design. 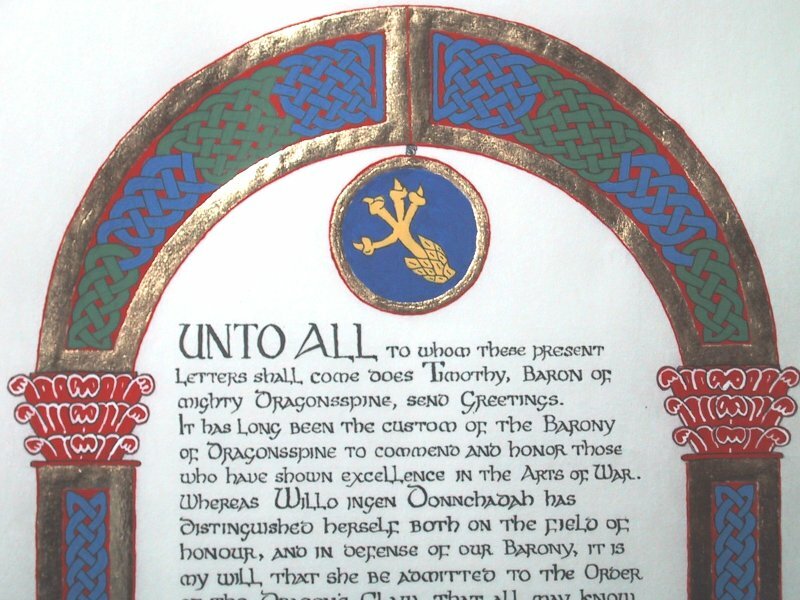 Gold leaf done using methods described in previous scrolls. Three shades of white-work done with different dilutions of white gouache, using water to blend with the background. Design: early 15th century French, based upon Hours of the Cross: Compline. (Waters 237, fol. 103; Cat. No. 17). 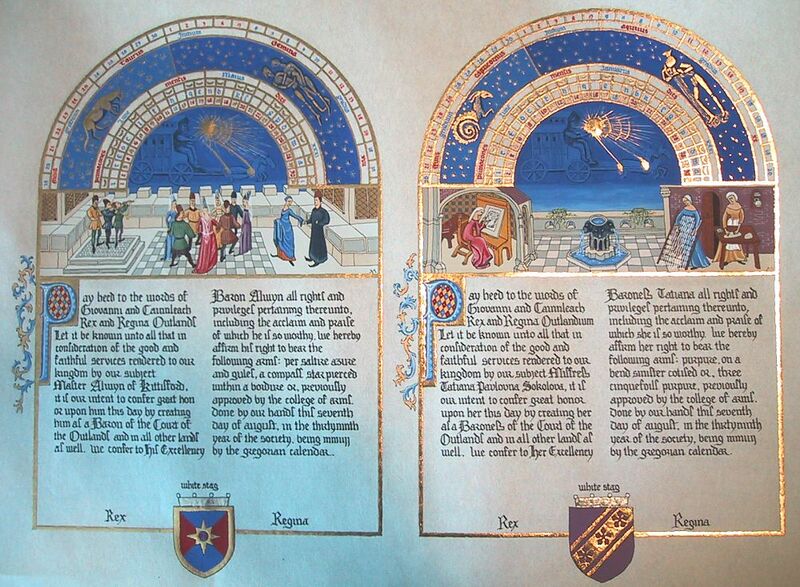 Reproduced in "Time Sanctified, The Book of Hours in Medieval Art and Life," Roger S. Wieck, plate 28, pg. 88. White work done using diluted white gouache with a crow-quill metal nib pen. Gold leaf done using methods previously described. Design: Romanesque, 10th century England. Inspired by a combination between the Eadui Psalter (Arundel MS 155, f. 133) reproduced in "The Illuminated Page," by Janet Backhouse, pg. 27, and Royal Bible Canon tables (Royal MS 1 E. vi, f. 5) in "The Illuminated Page" pg. 17. Extensive gold leaf done using methods previously described. Celtic knotwork designed using centerline construction method. First scroll done on white Pergamenata paper (untreated). 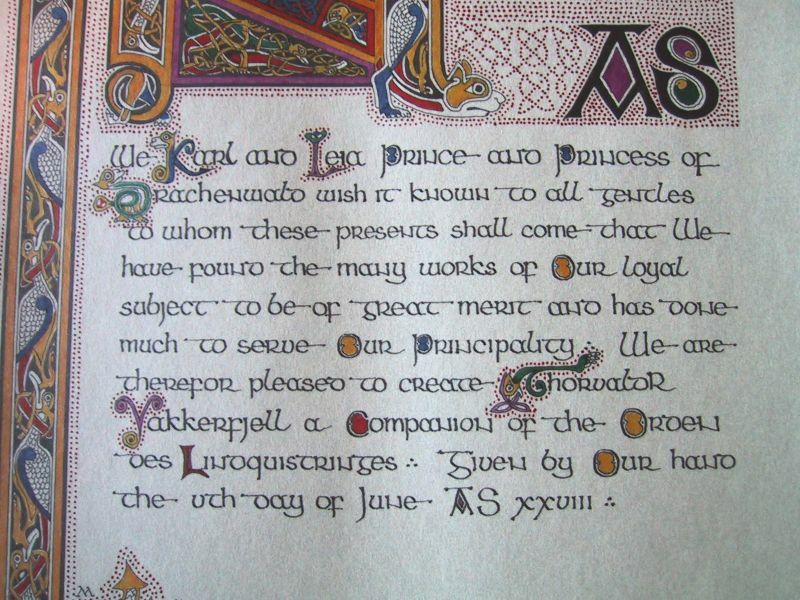 Hand: Artificial Uncial, Drogin pg. 99. First time using a 0.75mm Brause nib (previous scrolls used Mitchell nibs). All serifs done with twisting the nib pen during the normal calligraphy. I'm very proud of how nice the calligraphy turned out using this nib and the Pergamenata paper. 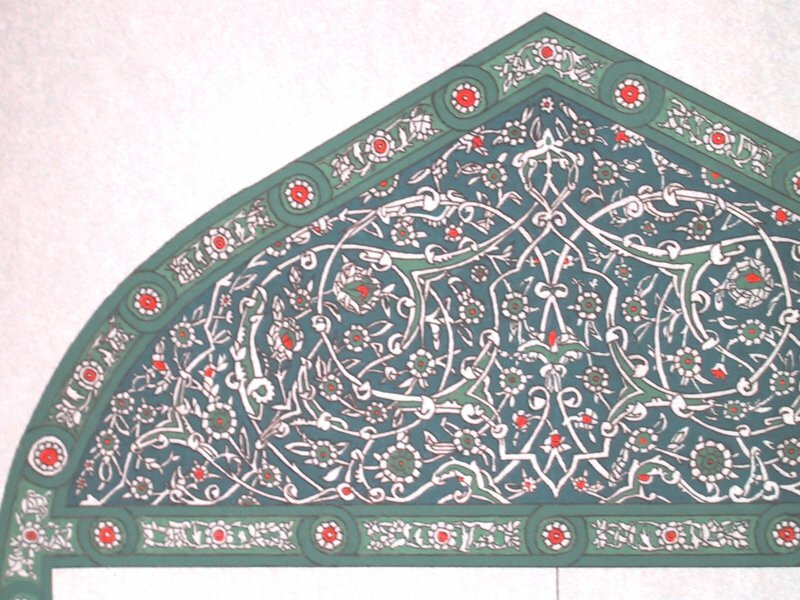 Design: Arabic, 16th century Egypt. 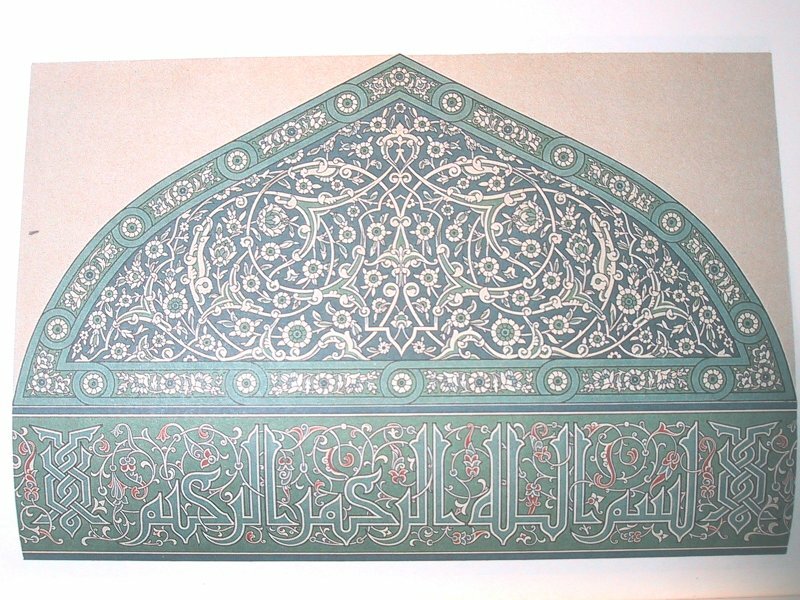 Based upon tilework from the Cathedral Mosque of Qus, as shown in Arabic Art, a reproduction of the 19th century L'Art arabe d'apr�s les monuments du Kaire by Prisse d'Avennes. Done on white Pergamenata, the top arch is a light table tracing of the tilework, with the lower border extending around all sides of the text. 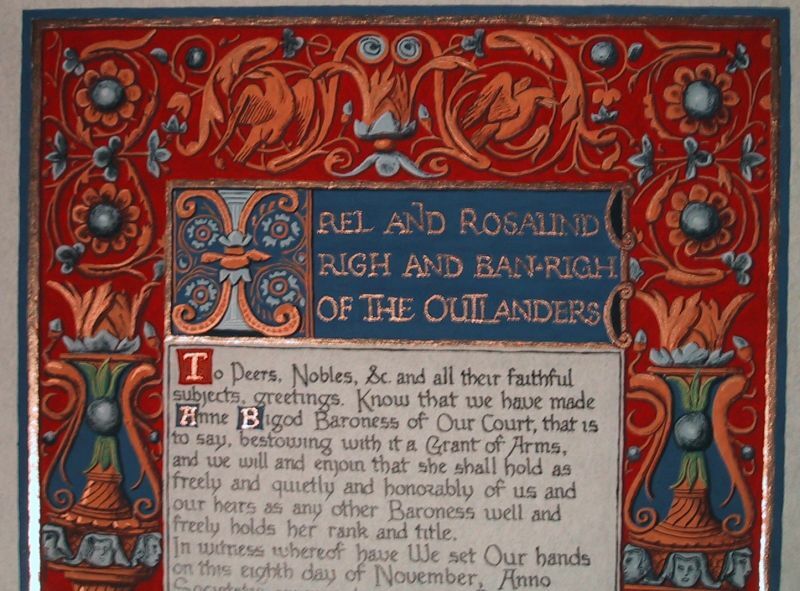 The bottom area in the original tilework was a line from the Koran and has been changed to read "Outlands" in this scroll, with the knotwork representing the green and white cord of the Queen's Grace award. 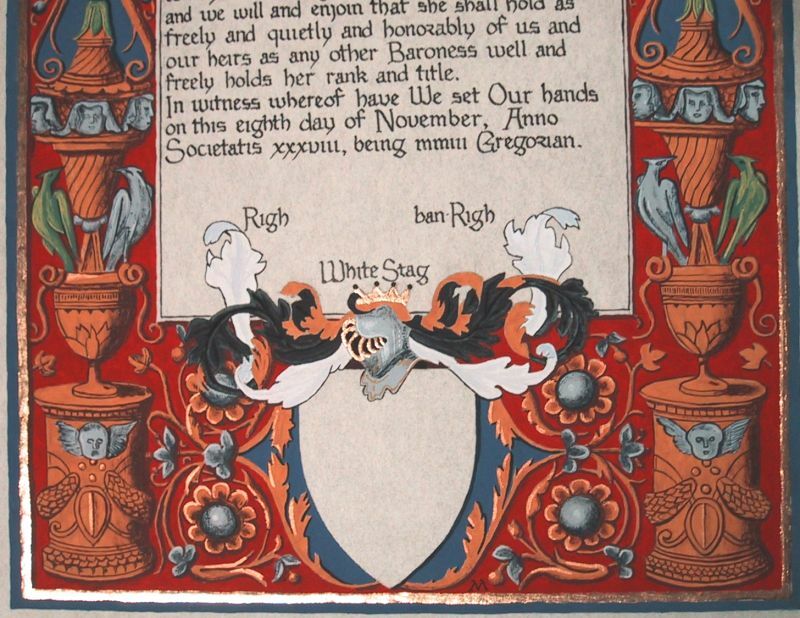 This scroll won the non-armigerous backscroll competition at the Heralds & Scribes Collegium, March A.S. 37 (2003). Design: late 14th century Italian, based upon The Visconti Hours. 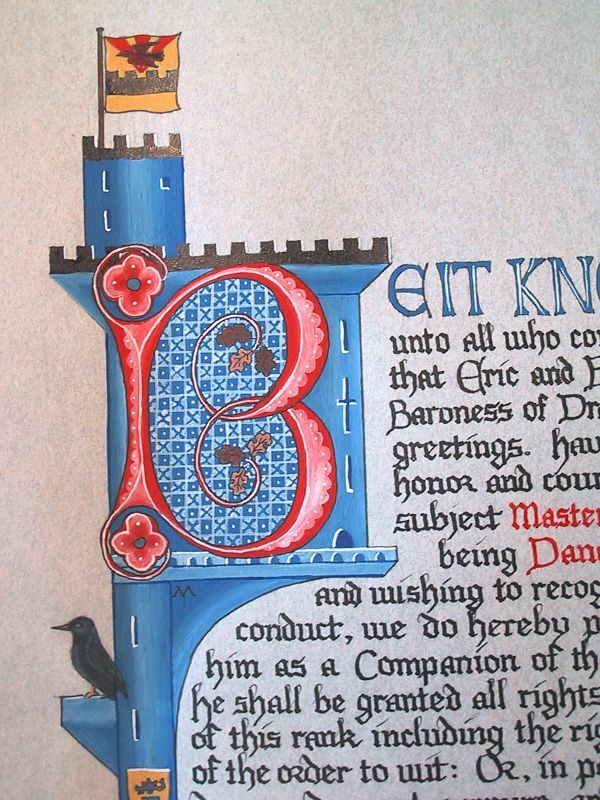 Inspired by the illuminated 'P' shown in LF89, the miniature within the 'P' has been replaced with a maiden embroidering in a tower. The portrait is of the recipient and depicts one of her beautiful cote-hardies. Hand: Gothic, Drogin pg. 139. 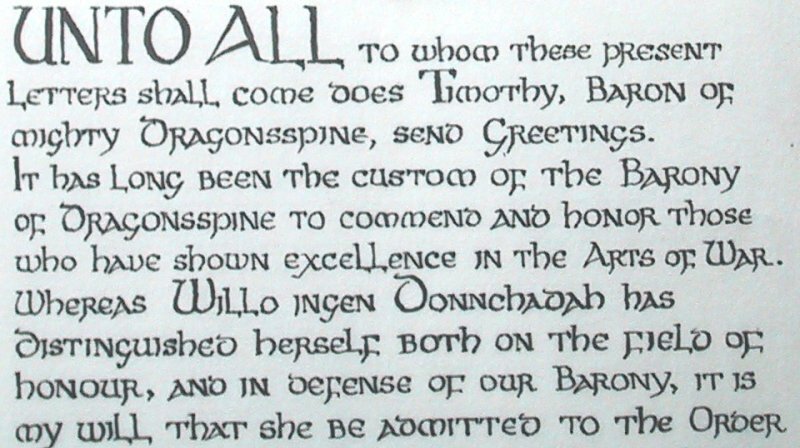 Unlike previous Gothic scrolls, the capitals used are Uncial Versals rather than the intricate French Gothic letters used previously. 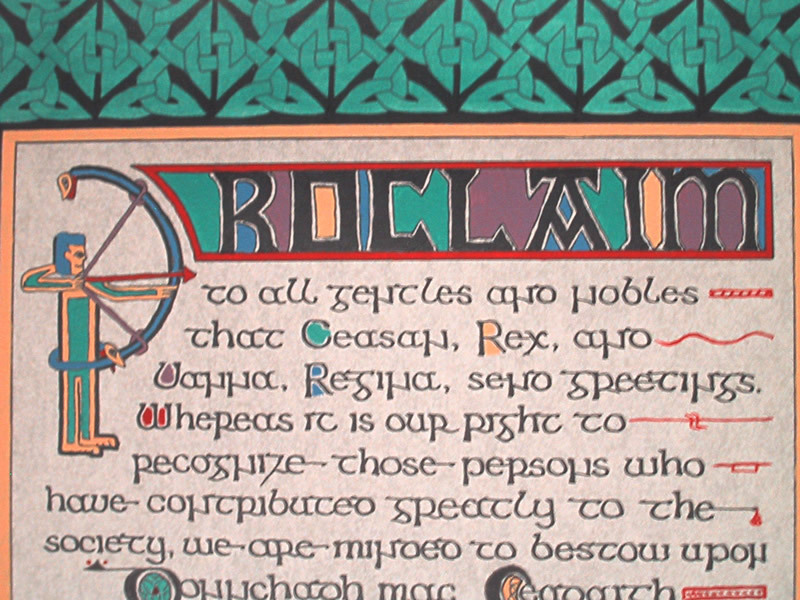 Design: Celtic, based upon The Book of Kells. 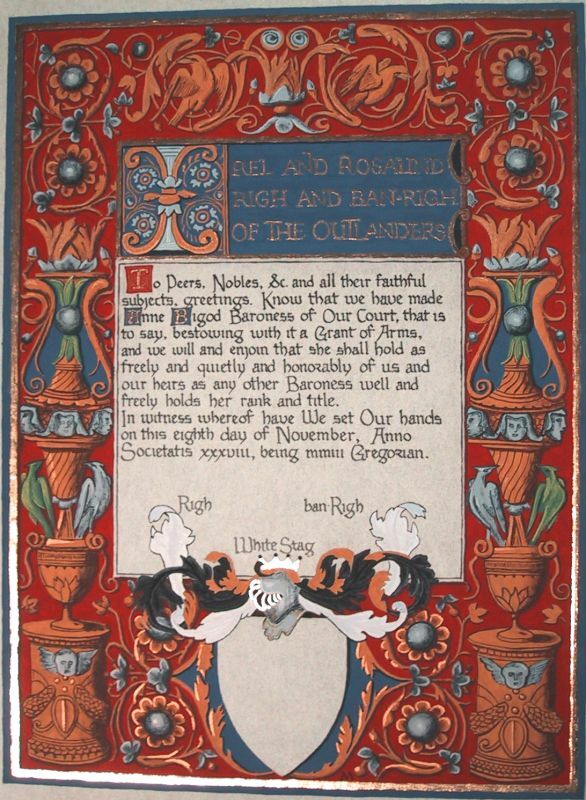 The inner border design is adapted from cross on back of the Ulbster stone, Caithness, circ 0599. See pictures of stone at http://www.archaeoptics.co.uk/products/ecms/sites/160.html. This design is also treated in "Celtic Art, The Methods of Construction" by George Bain, Plate G (pg 42). Square elements of cross are rearranged to form a border. The outer corners are an original knotwork design. 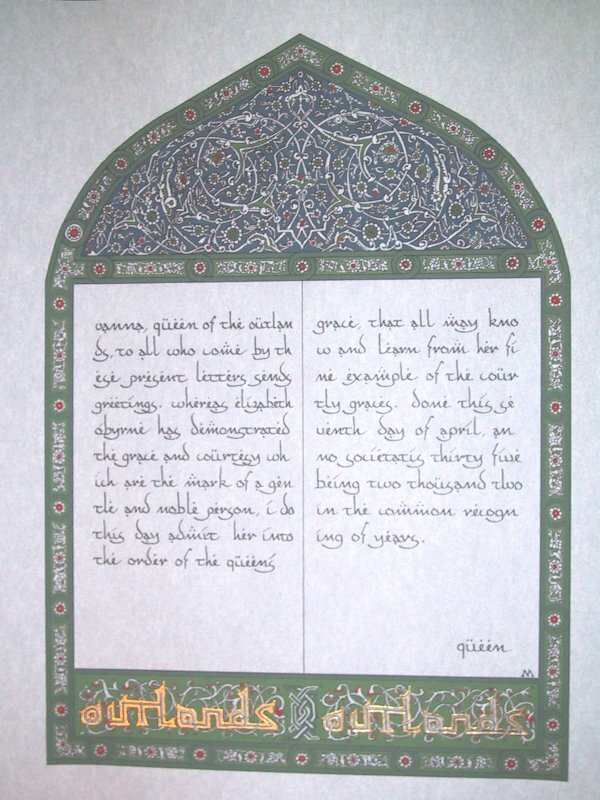 The spiral design in the center of each border is from the same book by Bain, Plate 4 (pg 62) from the Aberlemno Stone. The initial capital 'P' is my own design for an archer. 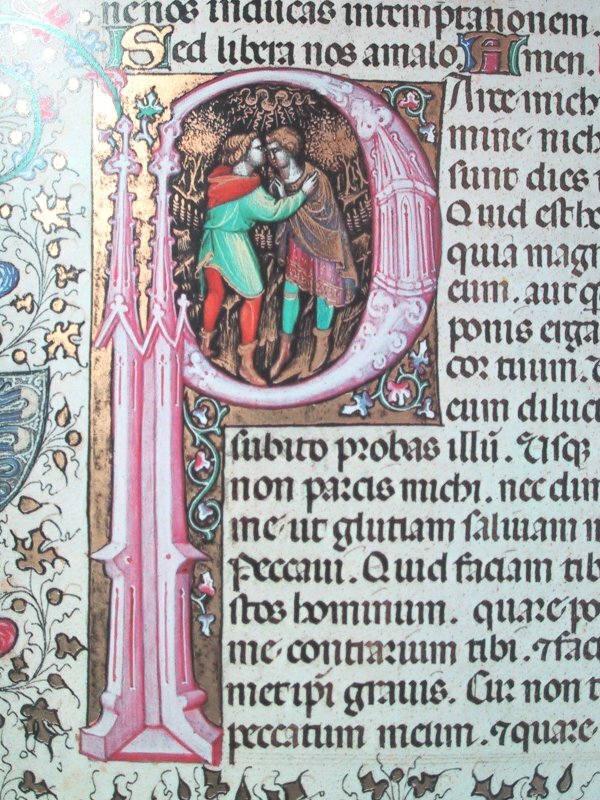 Design: late 14th century Italian, based upon The Visconti Hours. Inspired by the border shown in LF80v. 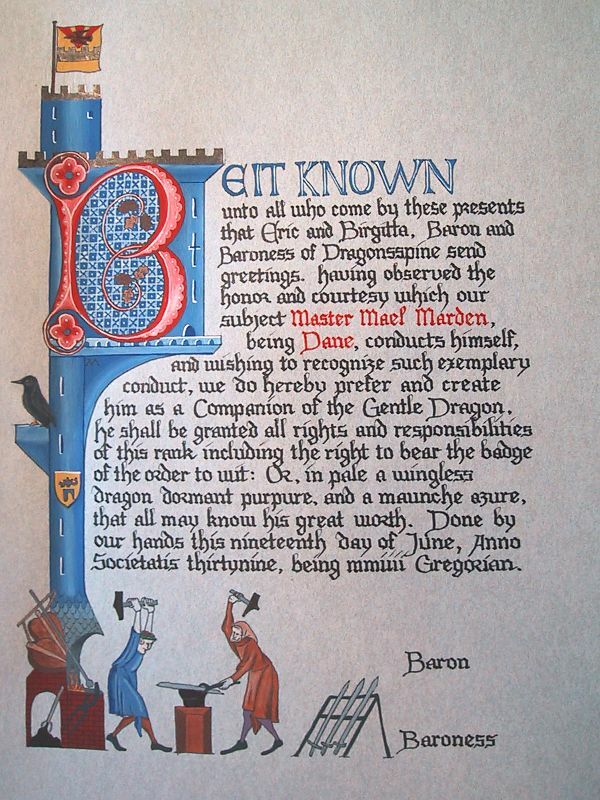 The style of the illuminated 'U' is a combination of the illuminated 'D' of the same page, along with the architectural style of many other pages in the Visconti Hours, and depicts Baron Timothy defending his castle. 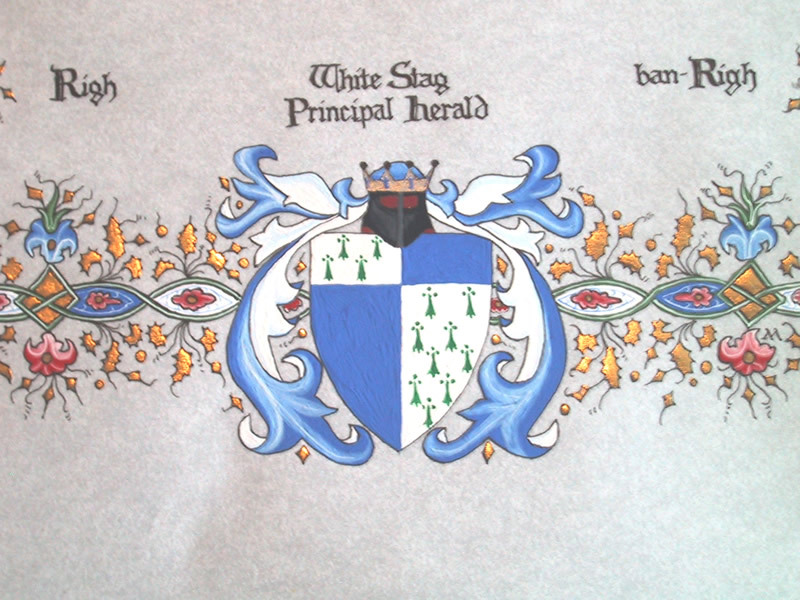 The Arms in the original border were replaced by the Achievement of Arms for a Court Baron, and the smaller Arms along the sides were replaced with symbols of various orders and activities (from upper-left, counter-clockwise): white column for Stag, Outlands badge, sword for Stags Blood, spoon/fork for cooking, golden trumpets for heraldry, golden heart for Stags Heart, Arms of the Baron of Dragonsspine. Added to the border are a white stag for the Kingdom of the Outlands, and a purple dragon for the Barony of Dragonsspine. 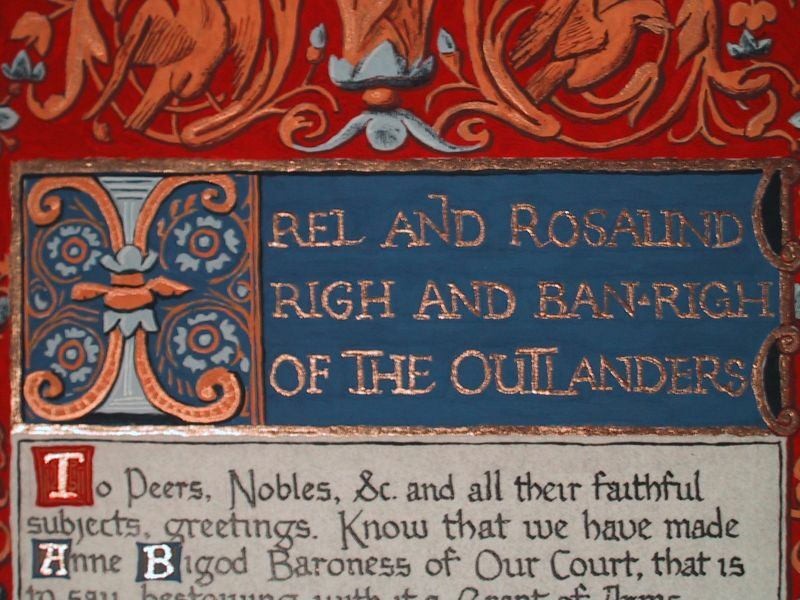 The coronet shown in the achievement shows the details of Timothy's actual coronet. For more information, see the A&S Documentation. 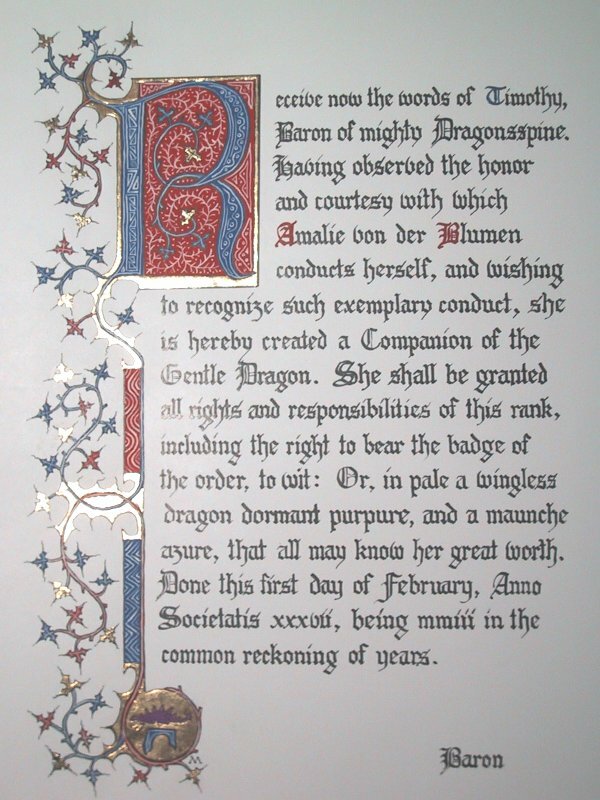 This scroll won the Visual category of the Dragonsspine A&S competition in Sept-03. 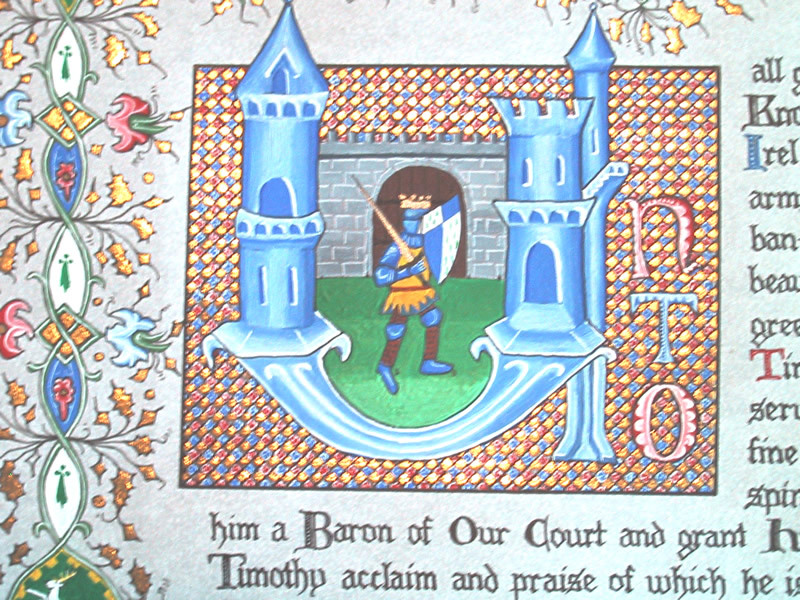 Design: Based upon an original music sheet from Henry VIII [http://www.standauffish.net/06music/pastime.html] for the song "Pastime with good company." 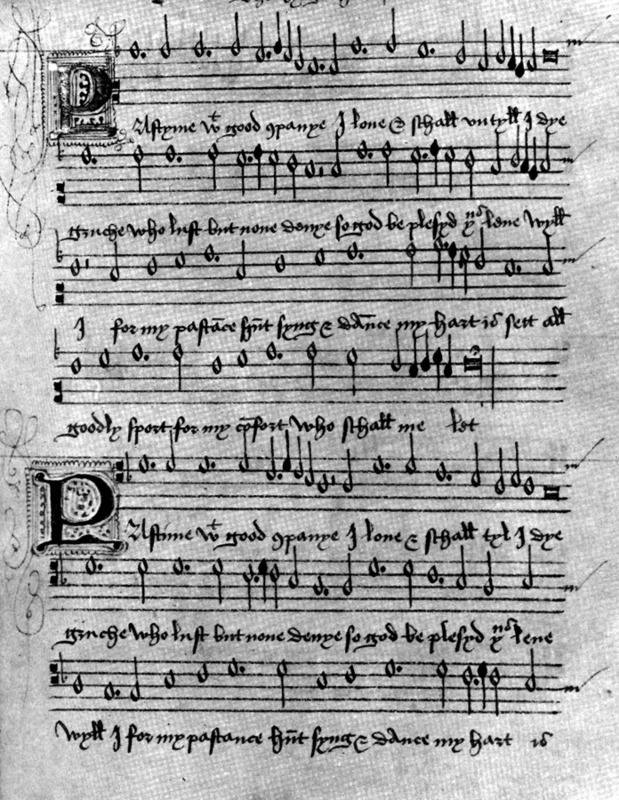 Words for song replaced with SCA scroll text. Red and blue pen filigree work added as per original. Hand: Gothic Littera Bastarda, Drogin pg. 155. 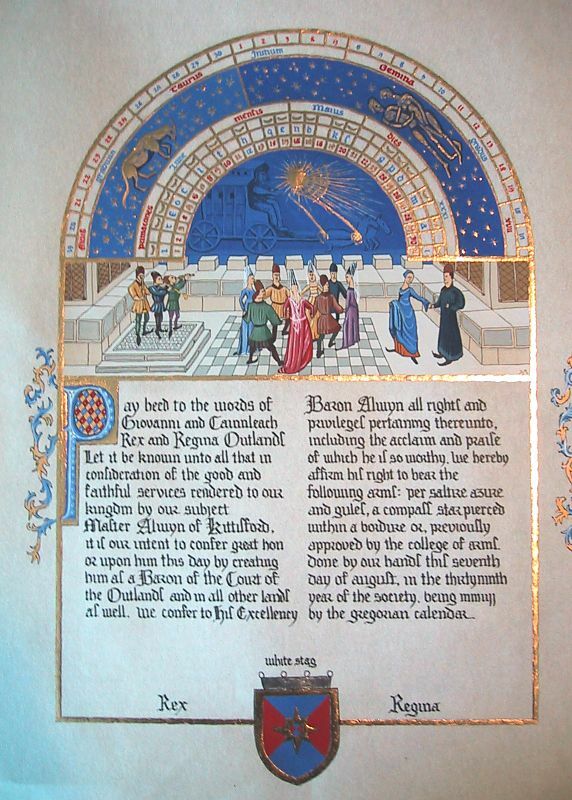 Design: Based upon the Svorza Hours. A combination of pages. For more details, see A&S Documentation. Hand: Italian Rotunda, taken directly from the original manuscript. 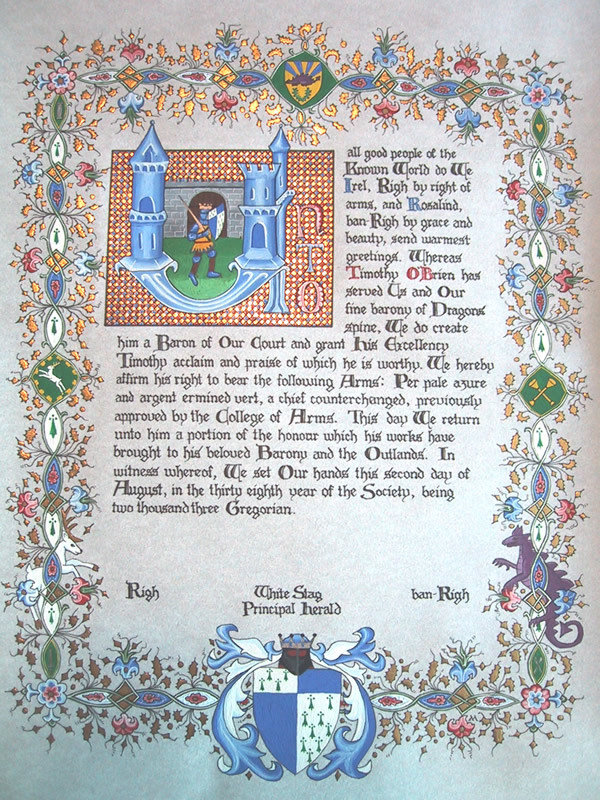 Design: first combat scroll. Filigree from 14th century England manuscripts. Original design. 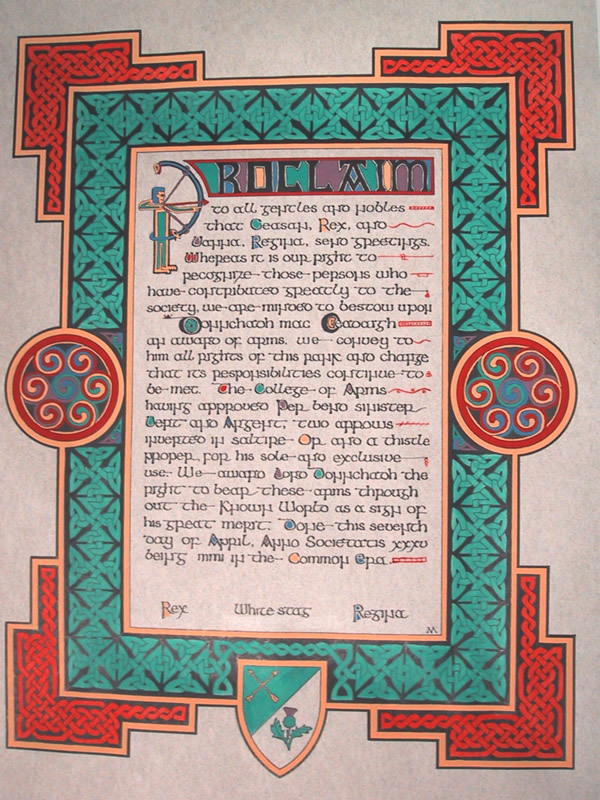 Design: Based upon the Lindisfarne Gospels. For more details, see the A&S documentation. Hand: Insular Majuscule, taken directly from the original manuscript. 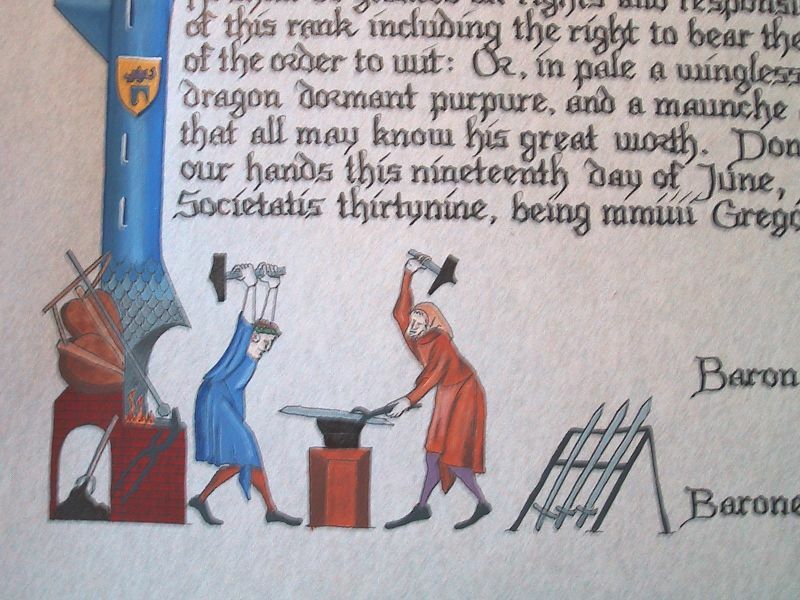 Design: Based upon Luttrell Psalter using a picture of a medieval forge from La Forge. Titled "Ravenskeep"
Hand: Gothic, Drogin pg. 139. 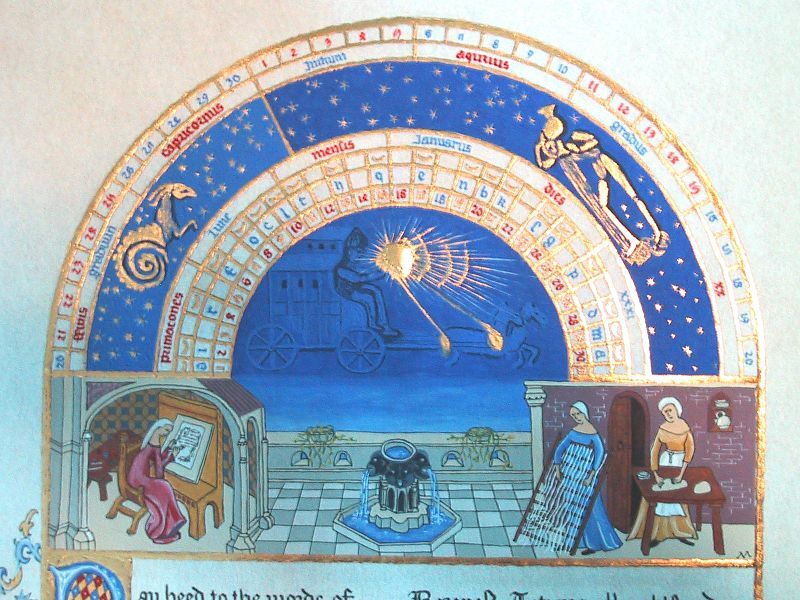 Design: Based upon the calendar pages of Les Tres Riches Heures du Duc de Berry. May and January calendars are for the recipients birth months. 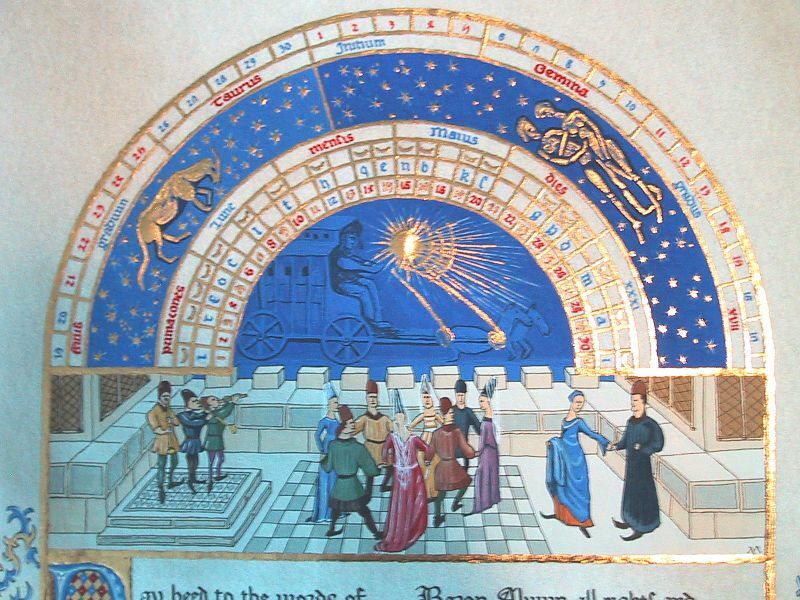 For details on the research done to decode the original calendars, see the research paper. 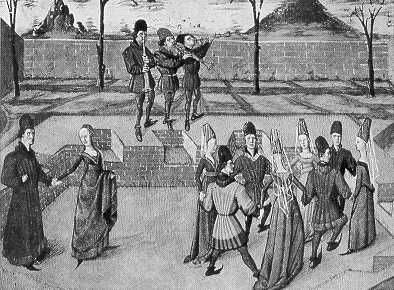 The miniature in the scroll on the left for Master Alwyn is a picture of couples dancing from 14th century France. 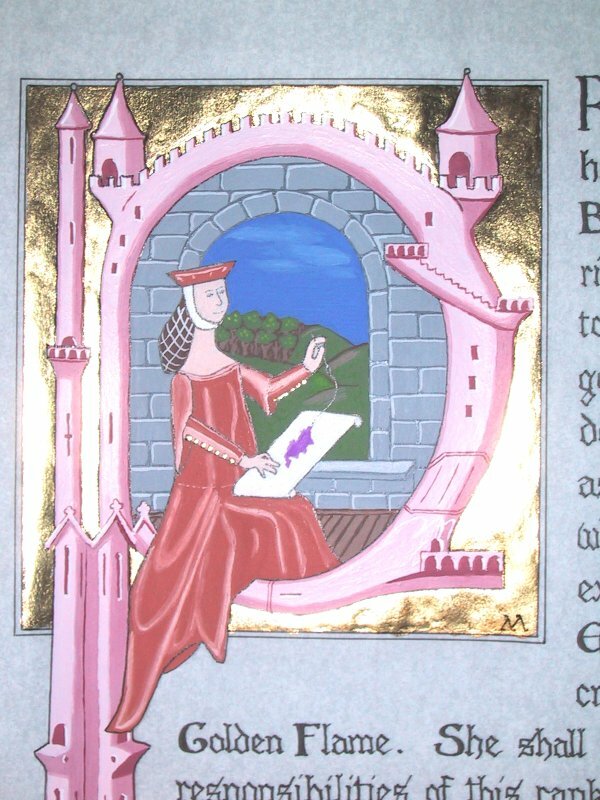 The miniatures in the scroll on the right for Mistress Tatiana are from The Medieval Woman and show a woman scribe and women making pasta. For more information, see the A&S documentation. Hand: Gothic, taken directly from original manuscript.